For mid August at least, a strong area of low pressure is currently centered in Nebraska. That storm is expected to travel from near Sioux Falls to the Twin Cities to a Duluth line over the course of the next 30 hours. 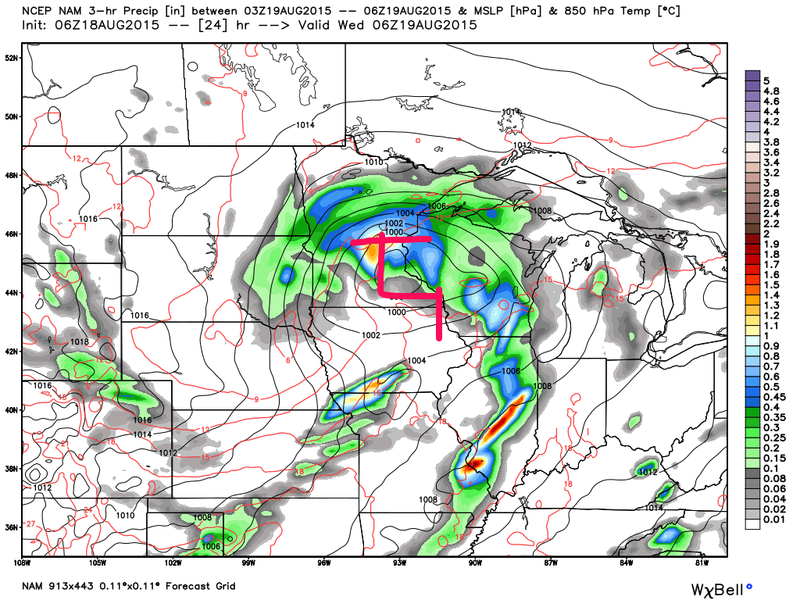 The center of low pressure is expected to be near the Twin Cities at midnight. Along and south of the low will be thunderstorms, some severe. Along and to the north and west of the low will be a persistent rain, locally heavy (2 inch +) in localized area. 1 AM Wednesday, August 19, 2015 Projected Surface Map and 6 hour rainfall. Although southwestern North Dakota did record some precipitation today, a high percentage of what this storm brings will be in southeastern North Dakota from an Oakes to Lisbon to Fargo line. 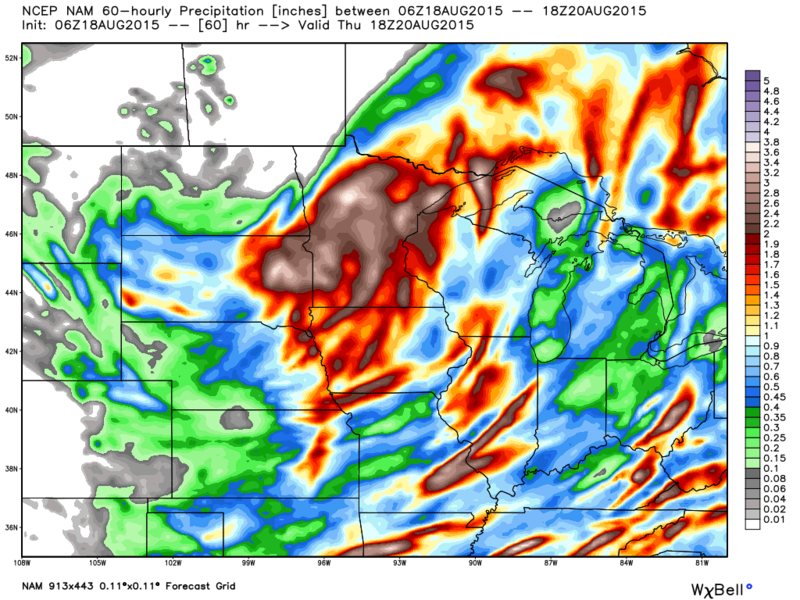 In Minnesota, much of the state will record precipitation with the exception of the far northwestern corner. Eastern South Dakota through Central Minnesota appear to be in the bulls-eye for localized rain in the 1 to 3 inch range. The North American Model estimated rain totals are below. My feeling is the heavier rain will be another 30-50 miles south of where this guidance is placing the heavier band. On Wednesday, much of North Dakota is expected to record a Sunny to Partly Cloudy day. The exception, the Red River Valley that may be slow to clear as the rain continues in much of Minnesota. 70s tomorrow in the sun, probably maximums in the 60s in the Red River Valley in the clouds, although, so mid to late afternoon sun could easily boost temperatures up to around 70°. It will also be quite windy behind the storm tomorrow with northwest wind at 15-30 mph and gusty. Thursday and Friday appear dry and much warmer. 80s on Thursdya in western North Dakota, closer to 80° in the east. 80s in all locations on Friday with some 90° + readings in central and western North Dakota. Friday appears breezy from the south at 15-25 mph and gusty. A cold front with some thunderstorms expected on Saturday with slightly cooler temperatures, then much cooler behind the front for Sunday and Monday with both of those days looking dry. So a bouncy road in the next week with most days below average.